Here’s a new product that is really hard to imagine hasn’t existed until now! Finally a bath faucet with the convenience of a pull-out sprayer! PISCATAWAY, N.J. (April 8, 2010) — American Standard is proud to introduce the new OutReach lavatory faucet, a unique dual control bathroom faucet that goes a step beyond the ordinary. Featuring an innovative pullout spray spout that extends up to 24”, the OutReach provides matchless flexibility and convenience in performing household tasks one simply can’t do with a typical bathroom faucet. With the new OutReach faucet, cleaning hard-to reach places in the sink, filling a flower vase or a bucket with water, washing a child’s hair and even bathing a small pet—have never been easier. A durable cast construction and seamless design provide for easy cleaning of the faucet itself. The Ceramic disc valve cartridge assures a lifetime of smooth handle operation and drip-free performance. 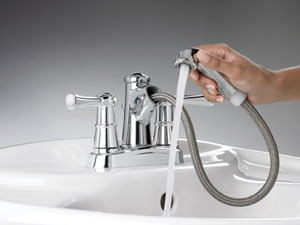 The OutReach faucet features American Standard’s exclusive Speed Connect™ drain with flexible stainless steel cable that is pre-assembled to the faucet body for fast and easy installation. All OutReach faucets are low-lead compliant, meeting the NSF Standard 61/Section 9 and Prop 65 lead requirements and WaterSense approved with a maximum flow rate of 1.5 gpm and water savings of over 30%. Available exclusively at The Home Depot, the new OutReach faucet comes in a choice of polished chrome or satin nickel finish and includes a lifetime warranty on function and finish–the faucets are guaranteed not to tarnish or scratch. For more information, please visit www.americanstandard.com or www.homedepot.com.